Apologies MUNI fanatics- this is the 10, not the 2 buses mentioned in this article. And isn’t it amazing Stanford got in? So I’m chatting with a coworker at lunch, who got the nickname ‘The Karate Kid’ because of a certain kicking action and a popped out bus window. He said he didn’t even want to do that- he just wanted to let the bus driver know he was there. His hands were full with groceries, and the bus was stopped at a red light. Note- he is expecting a bill in the mail. Then, my sister with 2 kids, one sitting on her lap, was on the 30 Stockton heading to Caltrain through Chinatown Saturday, and an elderly woman with a cane tripped over one of sis’ bags in the walkway. that’s right, you already guessed it- nobody helped the elderly, crippled woman get up from the floor of the bus. I guess my sister ended up yelling at a nearby guy to help this lady. Ah, bus stories. Some friends of mine were in town last night, and we were looking for somewhere to have dinner, so we decided to take the F line down to the Castro and have something tasty there. Naturally, the car was packed when it arrived, but we were able to squeeze on. I ended up standing next to two people who were wondering where they needed to get off (they were going to the Asqew Grill on 16th), and the other person next to me and I let them know. I figured it was just the two of them, and maybe the person across the car who they were talking to. When the car stopped, nearly everyone got up and walked out the front door. About halfway through I asked them whether they had reservations; they assured me they did. Counting us, about eight people were left on the car after they left. I mean, look at this! I find bigger things than this in my toilet! Of course, recent events don’t make me too confident about any of this, but we’ll see . . . Taxi Servitude & Solutions ? Seems that Taxi service is something that everyone loves to talk about, but a job that no one who seems to be an authority on it, actually wants to do. People love to complain about Taxi service… but few who do remotely understand the nature and forces at work in the business. As a “former” cab driver I would just say the deck is stacked so high against drivers from providing quality service , it’s amazing anyone gets anywhere. If I wanted to offer a cleaner cab, help out lil’ old ladies by carrying their groceries, or drive to return customer’s lost items… I was f*cking myself over because it’s always a race against the clock… and drivers LOSE ALL THE TIME. Why do you think many of the people who now take the mission on really have no idea where they are going, speak minimal English, and often have worthless social skills? Drivers are daily risking their lives not only in traffic, but in their cars alone against potential criminals and ‘no-pays”. Daily engaging in never ending one man wars against congestion, bureaucracy, gas prices, and the very annoying needs and griping of customers without any understanding of their situation takes a toll. The companies or city will not give drivers extra time, exemptions or compensation to help provide better or safer service, so what motivation do drivers have to provide it? 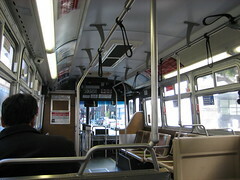 Today I took some pictures on the first day of Muni’s new T-Third service. It was a fun trip; I’d never gotten out to that part of town before, and like Mark, I’m also “a bit of a transit nerd.” Highlights after the jump. Because I’m a bit of a transit nerd, I took a few hours today to ride the new Muni Metro T-Third line on its first day of operation. The line is open for a shakedown period from 10 a.m. to 7 p.m. weekends only until April. Right now all the facilities of the line are in operation — the trains and stations. It runs all the way from Castro Station to the Embarcadero, the 4th St. CalTrain terminal, and all the way down Third St. on the east side of the city. It’s supposed to take 31 minutes to go from the CalTrain terminal to the end of the line at Sunnydale Ave. Today, it took a LOT longer. Clearly the operators are under instructions to take it slow until the people of the Bayview District get used to the idea of hundred-ton trains coming down the middle of their main street. After years of construction and delays, including a FUBAR’d reconstruction of the 4th St. Bridge over China Basin (photo), the MUNI T-Third St. light rail line is set to open tomorrow. The line extends service to the east side of the city, all the way down Third St. past 101 to the city’s southern border. Rides are free all weekend for those boarding from the 4th St. CalTrain station, but those boarding at other points on the line are supposed to pay full fare. The service will be open from 10 a.m. to 7 p.m. only during the weekend introductory period. Huge notices tacked up in the Muni stations now say that the T line will start running free on weekends for the next four months, leading up to its official unveiling for daily travel in April. The T begins at Castro station and terminates at Sunnydale Ave. Click here for the full account and for a list of the new stations serviced. Also mentioned on this page is that soon the N line will terminate at Embarcadero, while the T will go all the way down. They’ll run J’s to Caltrain, too, during peak hours. So be aware all you Caltrain commuters.